Actress and mother-of-three Julia Roberts recently weighed in on the college admissions scandal that led to the indictment of 50 people, including famous actresses, college coaches, parents and noteworthy CEOs among others. During an appearance on ITV's "Lorraine" to discuss her latest film, "Ben Is Back," Roberts shared what she felt is one of the saddest parts of the admissions scam. "That to me is so sad, because I feel, from an outsider, that it says a little bit, 'I don’t have enough faith in you,'" she said on the attitude of parents' implicated in the scandal towards their children. When asked about the way she raises her children, considering they are growing up in a household with famous parents, Roberts spoke about her and her husband Danny Moder's parenting styles. 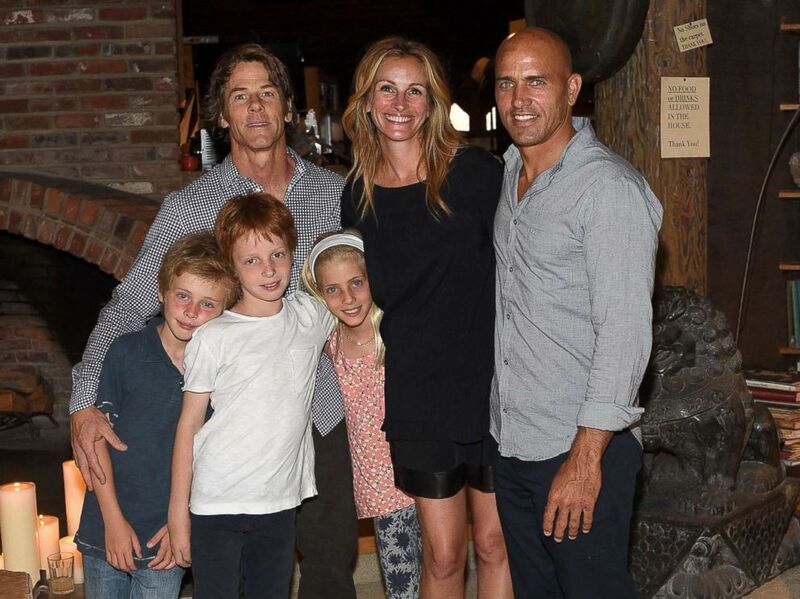 Daniel Moder, Julia Roberts, Kelly Slater, Phinnaeus Moder, Henry Daniel Moder and Hazel Moder attend an event on Aug. 29, 2015, in Malibu, Calif. They have to run their own race. They have to have their own experience. "My husband and I are very aligned on that front, I think that we live a very normal experience with our children," she said. "Obviously we have advantages that we didn’t have as children." "But I think that that’s the unique part of it," she continued. "Coming from the kind of childhood that I had, I raise my kids now -- I don't want them to have to have some of the struggles that I had, but at the same time, you do need to know how to make your bed, and how to do your laundry and be able to make one meal." "These are important life skills," she added. She said there's a balance between helping her kids and letting them learn for themselves. "You have to weigh the differences between what you look at as some of the maybe hardships I had, or things that I missed out on as a kid, but also -- they have to run their own race. They have to have their own experience." Roberts is one of the many celebrities who have weighed in on the scandal since it broke. John Legend, a University of Pennsylvania graduate, told ET, "I went to a good school. I think it's a longer conversation because I think a lot of people look at this rightly as fraudulent and dishonest." "But the bottom line is, the system has been rigged for wealthy people for a long time," he added. "The admissions system rewards people's parents being wealthy and people's parents having gone to a certain school. There's a lot of legal ways to do that that still aren't really that fair to a lot of other people." His wife, Chrissy Teigen, also commented on the scandal in a tweet of her own, referencing those alleged to have photo shopped their children's photos into athletic scenes in order to gain admission to elite universities. Actress Olivia Munn tweeted, "The irony will be that these parents spent all this money to hustle into top universities and are now in the middle of this s--- show just to find out in a few years that their kids only have dreams of being an influencer." She also shared: "What these parents did wasn't for love, it was for fancy diplomas. Love would've made you spend that money on tutors to make your kids smarter, giving them an actual education."